As anyone knows--doing Suzuki with a child takes preparation and work. As part of my preparation, I started making visual schedules for Emily. I even make the same visual schedules for her lessons. It really helps that we use the same schedule at home and at lessons. Someday, I may even laminate a blank schedule--then we can just Velcro the pieces in the order we want. But for now, I just print up a new schedule every week. As you can see we always start each practice with a bow. We then play a game. This time I put sections of the camel song under each cookie. She would pick up a cookie, find the section and play the song. Now, she can play Chant Arabe with two hands. I found it was better to learn the new song before doing review songs. If I did review songs first, she wouldn't have enough focus to work on a new song. We reviewed songs using Little People, and ended the lesson with a bow. We started keeping track of how many days we practice together with the fish bowl and a place value straw chart. I found my fish bowl at Teacher Direct. We have 70 fish in our fish bowl! So, we have practiced together for 70 days. 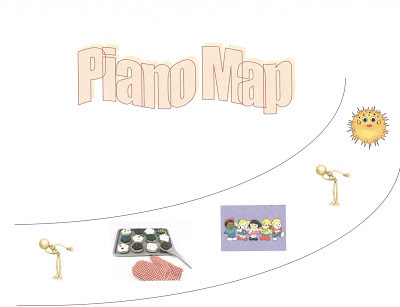 It is such a fun way to end our piano practice. She loves picking out the fish and taping them on the bowl. This new way of practicing and really helped us to focus on her pieces. She is making incredible progress! We only have three more songs in Book 1 to learn with both hands. We are aiming for a graduation concert in February. I am so proud of my little girl--she loves the piano. I must be doing something right with our practices--because she enjoys the time we spend together--and so do I!